Below is an extended version of the essay, ‘Preview: Josie Kunoth Petyarre: Sugarbags’, first published in Artist Profile Magazine, Issue 15, May 2011, pp.122-123. It was later reprinted in both English and Korean in the exhibition catalogue Josie Kunoth Petyarre & Gladdy Kemarre, produced by Mossenson Galleries on occasion of the 2011 Korean International Art Fair. Josie Kunoth Petyarre, Sugarbag Story 2011, acrylic on canvas, 61 x 151 cm. For many people, Aboriginal art is an impenetrable mystery. Despite its stunning beauty, there is a lingering sense that it will forever speak of a distant world, unreachable to those uninitiated into its sacred mysteries. But for those who take up the exquisite challenge posed by Aboriginal art, the question remains: how do we interpret these works, which speak such an alien visual language? Faced with this problem, many viewers first response is to ask for the story or ‘Dreaming’ that informs the artwork, in the hope that this narrative might offer some entry point into these difficult abstract works. In approaching the latest body of paintings by the Anmatyerre artist Josie Kunoth Petyarre, this is certainly one interpretative route that we could take. Although best known as a figurative painter, this new body of work represents the most sustained body of abstract paintings in Petyarre’s 25-year artistic career. However, one should be careful not to limit one’s reading of these paintings to a breakdown of their ‘Dreamings’, nor should one make too much of Petyarre’s recent moves into abstraction. For that would be to miss the clear lessons of Petyarre’s career, and to replay the primitivist desires that have sought to continually cast Aboriginal art as part of an arcane, primeval cultural context. Josie Kunoth Petyarre, Sugarbag Story 2011, acrylic on linen, 122 x 183 cm. If we survey Petyarre’s career, we find a marked continuity of concerns. Central to these concerns has been the centrality and adaptability of the Dreaming cosmology that shapes the Indigenous worldview. In his influential 1956 essay, ‘The Dreaming’, W.E.H Stanner described the Dreaming as the guiding principle by which Aboriginal Australian’s understand the universe. It is, he argued, “a kind of logos or principle of order transcending everything significant for Aboriginal man.” While it is easy to conceive this concept in the complex iconographies and hidden spiritual depths that underpin the cryptic forms of Aboriginal abstraction, in the paintings of Josie Kunoth Petyarre we see the Dreaming, not as something distant and mysterious, but something ever present, which runs through all places, people and things, from the past to the present, the sacred and the everyday. In this sense, they are a perfect illustration of the pervasiveness of the Dreaming logos described by Stanner. The daughter of Polly Kngale, Josie Kunoth Peytarre was born in 1959 at Utopia Homestead. Occupying 1800 square kilometers of the remote Eastern Desert, Utopia Station was been part of the last great push of pastoral expansion into Australia’s wilderness. Its red open plains, dusted lightly with Spinifex and wildflowers, offered the promise of serenity and prosperity. However, scorching hot days and freezing nights, scarcity of surface water and sparse vegetation, untold legions of flies and mosquitoes, all conspired to make conditions intolerable for the new settlers. By the 1970s, only the crumbling Ozymandias-like remnants of the station era remained, paving the way for a successful land rights claim, which in 1980 returned the newly designated Utopia Aboriginal Lands to their traditional owners. 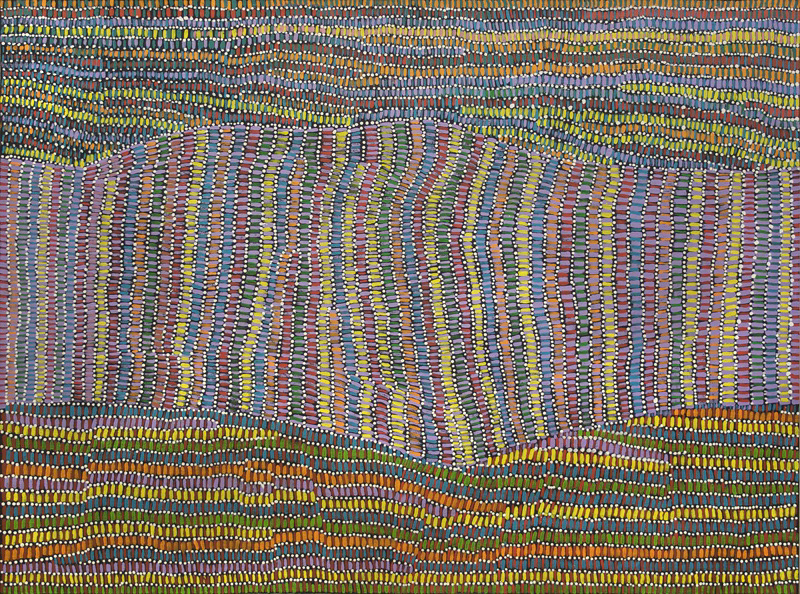 Like many women at Utopia, Josie Kunoth Petyarre began creating art as part of the Utopia Women’s Batik Group that emerged in the late 1970s. In 1987, she was included in the landmark exhibition, A Picture Story, which brought the practice of batik to its sumptuous conclusion. Containing all of the major artists from Utopia, it highlighted the resplendent diversity of approaches to the medium. The following year, she was included in the exhibition A Summer Project, which introduced these same artists to the practice of acrylic painting on canvas, creating the conditions for emergence of one of Australia’s most important painting movements. In 1987, Josie Kunoth Petyarre was still a young woman. The catalogue for A Picture Story shows her as a beaming 28-year-old, a young mother with a wistful smile and an unflappable demeanour. It was the older artists in the exhibition who garnered the most attention, in particular, Petyarre’s aunt Emily Kame Kngwarreye (c.1910-1996). With their striking visual affinity to American abstract expressionism, Emily’s grand abstractions opened new possibilities for the understanding and appreciation of Indigenous art. At the same time, they cast a long shadow that has obscured the diversity of artistic practice that has been a continual presence at Utopia. Whether bold and gestural (such as the paintings of Emily Kngwarreye or Minne Pwerle) or delicate and ethereal (Kathleen Petyarre or Gladdy Kemarre), the art of Utopia quickly became indelibly associated in the popular imagination with abstract painting. However, as the batik created by Petyarre for A Picture Story reveals, abstraction was always only one part of the art tradition at Utopia. Ngayakweneme (The Hungry People) is a vibrant Dreaming tableau in which armed warriors feud over the distribution of food, while tiny ethereal spirits haunt the crevices of the landscape. Twenty years later, this flair for action and detail would culminate in Petyarre’s grand narrative paintings of bush football carnivals and community life at Utopia. In the shade of Utopia’s celebrated abstractionists, the work of figurative artists has often been dismissed as naïve or ‘inauthentic’ fusions of western and Indigenous traditions. Such criticisms are nearsighted, ignoring the fact that figurative elements were present from the genesis of Utopian art, even amidst the artworks of celebrated abstractionists like Emily Kngwarreye and Kathleen Petyarre. The distinction that is commonly assumed between ‘abstract’ and ‘figurative’ works is a peculiarly western one. In part, this is because western aesthetics does not have the same sense of the inherent sanctity of decoration that is present in Indigenous culture (that is, the power of abstract designs to convey secret or sacred meanings). For Indigenous artists, traditional designs are rarely non-objective in the way that is implied by the categorisation of ‘abstract art’. Historically, when Indigenous art-styles have become more abstract, it has been through either a desire to hide or obscure secret/sacred content, or in an effort to tailor the work to suit market trends. If we move beyond this dichotomy of abstract and figurative, we can begin to see the figurative tradition at Utopia as offering its own peculiar insights into the development of art at Utopia. This neglected movement offers a unique insight into both traditional and contemporary existence at Utopia, while revealing its own internal processes of artistic innovation and development. Josie Kunoth Petyarre, Sugarbag Story 2011, acrylic on linen, 91 x 121 cm. For most of her life, Petyarre has lived on remote outstations, where the production of art is a ubiquitous part of the daily routine. Petyarre, however, remained in the background, producing occasional works, but never really stepping out of the shadow cast by her celebrated elders. This would change rapidly in 2005, when she began working with the art-advisor Marc Gooch. Starting primarily as a carver, Petyarre produced one of the most innovative bodies of carvings to ever emerge from Utopia. Using wild colours and unexpected forms, she produced works that reflected her life and personality. According to Marc Gooch, “Each one was like a self-portrait, revealing her spontaneity and individuality.” Petyarre’s first body of sculptures contained all the conventional motifs of Utopian carving – there were extraordinary figures in ceremonial dress, feathered birds, and a colourful array of dogs, echidnas and camels. But alongside this wild menagerie, a different picture of life at Utopia began to emerge, as Petyarre produced a series of more contemporary objects including a bright pink Toyota and a meticulously detailed police van. Soon, Petyarre’s husband Dinni Kunoth Kemarre also began producing sculptures. Together, the pair would ‘head out bush’ with their axes to find the soft-wooded Bean Trees (Erythrina vespertilio). Sometimes these trips would require 100 kilometre long drives to find appropriate trees. After felling the tree, they would bring the trunk back to their camp, where they would carve it using tomahawks, files, sandpaper and a large rasp. Together, the pair would produce 16 football players (one for each team in the Australia Football League) which would be make up the exhibition Centre Bounce held at the AFL Hall of Fame in Melbourne between March-July 2007. The opening of Centre Bounce afforded Josie and Dinni the opportunity to visit Melbourne. It was an eye-opening event for the pair, never having travelled before to such a metropolis. While older artists often view cities with an unflustered nonchalance, Josie and Dinni were captivated. The scale, the lights, the country and the fauna (including Melbourne’s ubiquitous possums) inspired a new body of works that perfectly captured the meeting of these two very different worldviews. 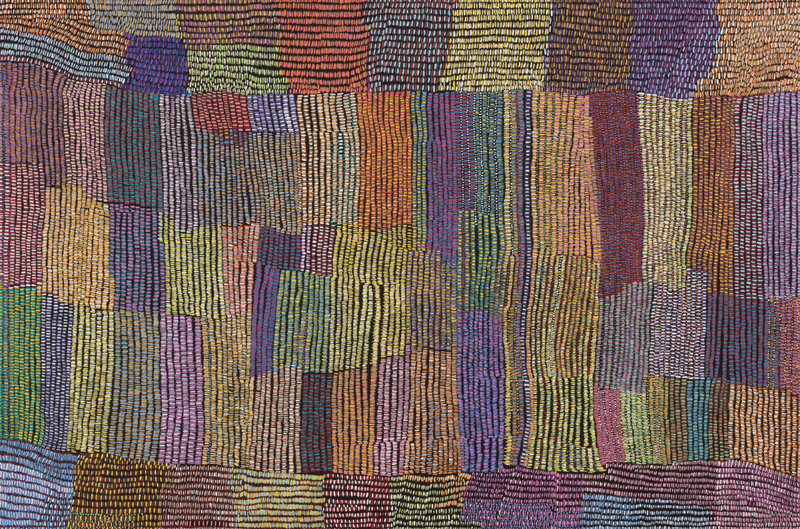 Josie Kunoth Petyarre, Melbourne Story 2007, 153 x 122, acrylic on canvas. Returning to Utopia, Petyarre unexpectedly embarked on a series of paintings that sought to synthesise all of the complex experiences of their visit to Melbourne. They produced several extraordinary large-scale canvases that assimilate the cityscape of Melbourne into a Central Desert sense of geography. These maps of the city incorporate Melbourne landmarks – the MCG, St Kilda beach and pier, Luna Park, the Royal Exhibition Building, Fitzroy Gardens, Swanston Street, St Paul’s Cathedral and Federation Square – into an Anmatyerre spatial logic. In a fascinating and vivid meeting of two visual experiences, the paintings present an engrossing, enlivening picture of the urban landscape as seen from a radically different cultural background. 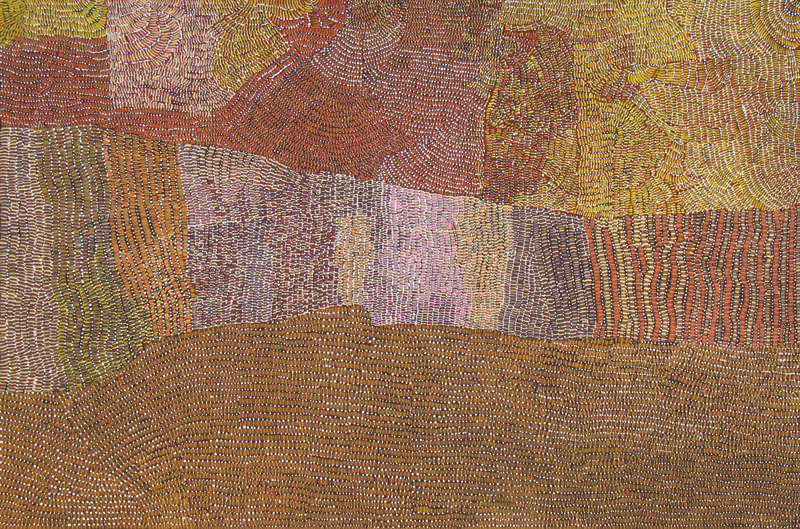 What was most notable about these paintings, was that for Petyarre, urban and remote were placed in an even and connected system of exchange – in a very similar way to which sites of significance are connected in Tingari paintings. This equality of exchange was made brilliantly explicit in a spectacular diorama that Josie and Dinni created for the inaugural Basil Sellers Art Prize held at the Ian Potter Museum of Art at Melbourne University in 2008. In this installation, scenes of professional and community football were literally placed side by side as part of a co-joined narrative. The cultural diaspora of football was no longer framed as one-directional, but working along a songline mentality in which all action and places are connected. By this relational logic, travel and movement unites significant places – the MCG becoming just one stop on a football songline that unites Utopia with the capital cities of Melbourne or Perth. In these football paintings, the central motif of the oval as a capacious elliptical space organises two different types of action: the regulated play on the field, and the carnival atmosphere off it. The representation of football becomes not just about the players’ participation, but about the overall participatory spirit enjoyed by sportspeople and spectators alike. The result is a vivid tableau of all-over action. Although it acts as pivot to this action, the football match itself is not exclusively preferenced, and in some works is completely overwhelmed by the scale of events going on around it. In this way, the whole world is absorbed and united within this immutable and adaptive cosmology of the Dreaming. 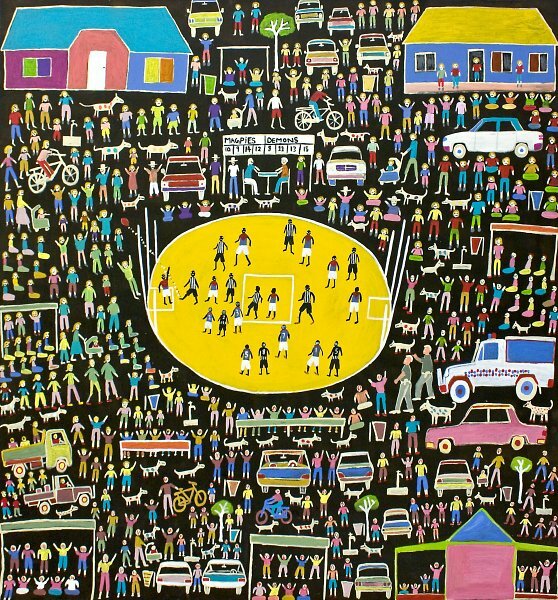 Josie Kunoth Petyarre, Bush Football Carnival 2010, acrylic on canvas, 151 x 151 cm. Josie and Dinni are true innovators within their tradition, effecting change and integrating it into everyday practice. Tradition and change are intrinsically linked. Change is inevitable in all living cultures, and the form that change takes relies on the vision of the instigator. In the [art] of Josie Kunoth Petyarre and Dinni Kunoth Kemarre we get a sense of past, present and future. This fusion of innovation and tradition is clearly evident in Josie’s Sugarbag paintings, where the recognisable forms of desert paintings are flung together with a compelling joie de vivre that shows an artist clearly relishing the experimental possibilities of the motif. After several years of mining the world around her for inspiration, the openness of this format is clearly vivifying. 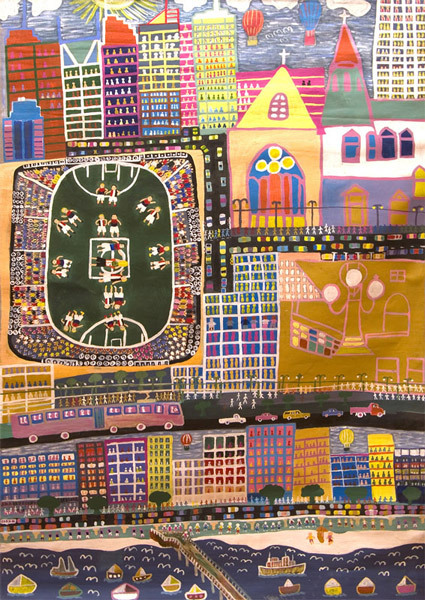 Josie Kunoth Petyarre, Sugarbag Story 2011, acrylic on canvas, 200 x 200 cm. However, it would be wrong to overstate the extent that this expressive freedom is derived from the ‘abstract’ nature of the sugar bag motif. In Indigenous Australian parlance, the term ‘sugar bags’ is used to describe the sweet honey made by one of around 14 species of native stingless bees found across Australia. As a visual motif, it is one of the most variable and iconic in Australian Indigenous art. For thousands of years, sugar bags have adorned the faces of rock-art sites in the Kimberley, Arnhem Land and the Central Desert. With the dawn of the Indigenous art movement, the sugar bag emerged as an emblem of seemingly endless iconic possibility. In the paintings of artists as diverse as Bardayal ‘Lofty’ Nadjamerrek, Jack Britten, Barney Ellaga, Jimmy Wululu and Lucy Ward, it has provided both a source of sweet inspiration and potent formal potential. In most instances, the sugar bag is a symbol of tripartite significance. On the one hand it refers directly to the bush honey collected from the hollows of trees or crevices of rock shelters. On a more abstract level, the sugar bag usually refers to a particular Dreaming associated with a specific place. Lastly, the painting of sugar bags is often used to assert a totemic or ancestral connection to that particular place. In this sense, therefore, it is a visual metaphor of physical, personal and spiritual dimensions. According to Petyarre, these paintings contain ‘all the sweetness of the bush’ – not just the sugar bags themselves, but also the colourful bush grevillea and corkwood flowers that produce the honey, the changing colours of the season, and the travel of the bees across the landscape. In Petyarre’s case, this is landscape of her father’s Alhalkere country of Utopia in the eastern desert, to which the sugar bag Dreaming is associated. In Petyarre’s sugar bag paintings we can see an artist using a stored cache of visual ideas – circles, dots, dashes – and twisting them in order to find new ways to depict the overlap of country and culture; to represent the shifting metaphors of the physical, geographical and spiritual. What could be waterholes or sandhills, winding rivers or desert blooms all come together in a personal experiment in colour and form. This is not a form of experimentation structured along modernist lines of non-objectivity, but rather, one structured around a particularly Anmatyerre reasoning, in which the sugar bag as bush tucker is as much a lived reality as the ancestral connections that it connotes in both the spiritual and everyday environment. 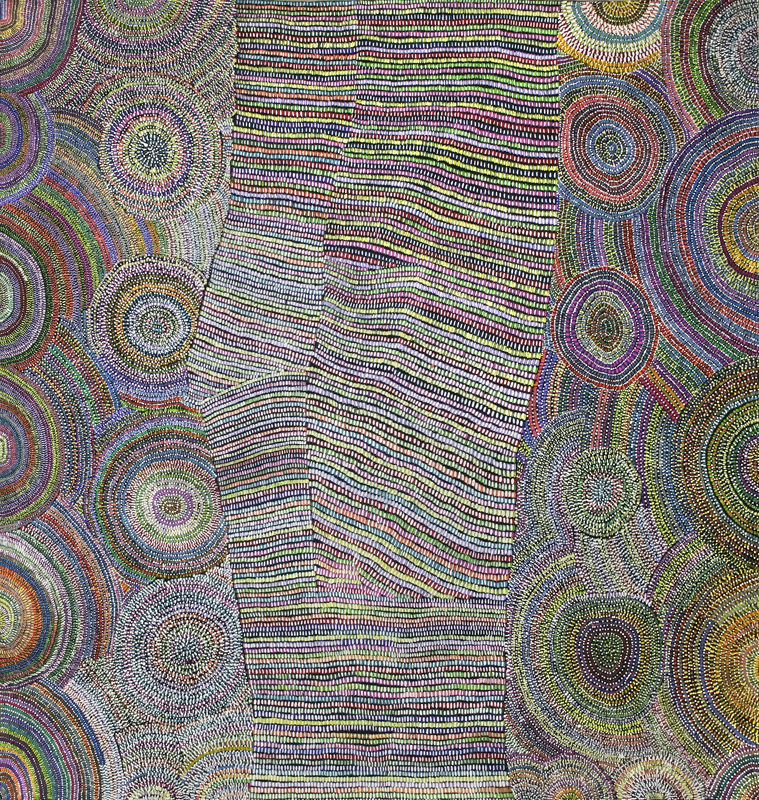 If we see Josie Kunoth Petyarre’s sugar bag paintings, not as a break from her figurative works, but as a parallel articulation of the same episteme, we can begin to see them as two different, but complimentary articulations of a world is absorbed and united within the immutable cosmology of the Dreaming. The alchemy of Petyarre’s innovation is her ability to continually find new ways to express this ancient cosmology. W.E.H. Stanner, “The Dreaming,” (1958) reprinted in The Dreaming and Other Essays (Melbourne: Black Inc. Agenda, 2009), 58. Marc Gooch, personal correspondence with author, 2010. Nick Tapper, “Bush Football: The Kunoth Family,” exhibition room brochure, Mossenson Galleries, Melbourne, 18 August-5 September 2009. Bruce McLean, “Dinni Kunoth Kemarre and Josie Kunoth Petyarre,” in Xstrata Coal Emerging Indigenous Art Award, exhib. cat., Queensland Art Gallery, 11 July-12 October 2008.